A marble tile floor is breathtaking in it appearance, and it sets the tone for decorating the entire room. Natural stone is long-lasting and greatly increases the value of the property. Many homeowners choose to install marble flooring themselves without professional help. The task is not all that difficult, but locating a supplier of affordable yet high-quality marble can be a frustrating task. Marble is shipped from overseas quarries to the United States in ocean-going containers. This product is expensive when purchased in small quantities. The amount of labor involved to extract the stone, the cost involved with cutting and shaping the tiles, and the international freight charges associated with transporting the material can drive up the per-piece cost dramatically. Choosing a direct importer and distributor will ease this cost to some degree, especially if the company chosen is also the manufacturer. We are a unique company, built on the principle of direct manufacturer-to-consumer trading. Because we own and operate our own fabrication centers and import our own product rather than purchase from a broker, we can offer our customers the lowest possible price on fine-quality marble flooring tiles, even if the material is purchased in smaller-sized quantity. The subfloor must be covered with a thin layer of cement or mortar, and this surface must be smoothed and leveled prior to laying the tiles. In order to protect the subfloor from moisture intrusion, a vapor barrier is used. This material is called cement board and is available in square sheets. The cement board can be fastened to the subfloor using 1 1/4-inch screws. After the barrier is installed, the center point of the room is determined and marked. Chalk lines are drawn both horizontally and vertically, and the size of the resulting squares should be slightly wider than the tiles themselves. Rather than starting at one wall and working across the room, tiles should be laid from the center of the room first and the work radiated outward toward the walls. This will result in the best use of similarly patterned tiles, giving the entire floor a uniform appearance. As the installation procedure nears each of the walls, narrower pieces of tile are cut to fit against the baseboard. 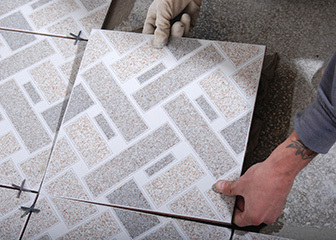 Thin-set mortar is used to cover each of the squares drawn upon the cement board. It is best to mix just enough mortar for about a dozen tiles. Otherwise the mortar will begin to set before it is spread upon the floor. The mortar is set on one square of marked floor and spread with a notched trowel. The tile is then placed upon the mortar, tapped gently with a rubber mallet to clear any air bubbles, and allowed to set. Tile spacers are placed at each corner of the individual pieces. This ensures even spacing between each of the tiles. It is important to look over the tiles carefully and choose 10-12 pieces that can be placed together with uniform patterning. After the tiles are in place, they should be allowed to set for at least 36 hours. The spaces between the tiles are then filled with grout. Excess grout must be wiped from the surface of the tiles while it is still wet. Dried grout is extremely difficult to remove from the tiles and will cause discoloring when the sealant is applied. The tile floor is sealed with a special compound, available from flooring product retailers or tile suppliers. The sealant should be reapplied once every two or three years. The sealant not only prevents water from percolating through the stone, it also helps to prevent scratching of the marble. Marble has long been praised as one of the most desirable floor and wall coverings. It is long-lasting, requires very little maintenance, and beautifies an indoor environment like no other material can. Marble is also quite functional in that it acts as a natural air conditioning system. Marble helps keep energy costs lower during the summer months because it causes a cool air layer to form over the floor surface. Marble is formed over millions of years. High pressure caused by the movement of the earth’s tectonic plates squeezes different rock compounds together, and the result is a metamorphic and igneous process that transforms the stone. The striations and splotching seen in marble tiles is testament to these tremendous forces. The rock itself is actually rather easy to cut and shape, and polishing the stone results in a beautiful, shiny surface. Marble is somewhat brittle, however. It is therefore necessary to use specialized cutting equipment in order to minimize waste when the sheets are thinned and separated into individual tiles. These tiles are stacked end-to-end, placed into sturdy containers, and loaded onto ocean-going freightliners for transport to destinations around the world. Because of the high labor costs involved with cutting, shaping, and transporting marble, finding an affordable supply of this natural stone can be difficult. Many flooring companies have a section of their showroom dedicated to natural stone tiles, but in most cases the cost is excessive unless thousands of pieces are purchased. Some merchants choose to buy their material from a broker or reseller who in turn purchased the tiles from an overseas wholesaler. If the manufacturer also acts as the shipper, importer, and distributor, the cost of marble tiles will be significantly lower. However, it is wise to check out the product line before getting too excited about the advertised wholesale price. Many companies offer what is referred to as manufacturer’s wholesale pricing, but the choice of color shades and pattern styles may be quite limited. This is because each geologic formation of marble is unique, and these quarries are owned by different companies. In some cases, the marble is extracted at only certain times of the year, and brokers or resellers have already made an advanced purchase of hundreds of tons of material. This leaves a shortage of product available to overseas buyers, meaning that the showroom may have samples that are not currently in stock. Nalboor is different in that we own and operate our own manufacturing centers. Our tiles are available year-round because we are constantly importing material to keep our distribution center stocked with all of the marble stone varieties seen on Nalboor. Even better, we can offer reliable price quotes and guarantee these prices even if the order placed by the client requires special fabrication. Even if the job is a simple one, requiring only several hundred pieces of tile for a single-family home, do-it-yourself installers will save money by purchasing from a direct importer and distributor. The products showcased on the Nalboor Tiles website are less expensive when purchased in full container loads, but even individual consumers needing only 1,000 square feet of tile will save money when purchasing from Nalboor. Our pricing is based on quantity, but our tile products are offered at truly wholesale cost because the buyer is obtaining material directly from the manufacturer and importer. Our marble product line includes the most popular and sought-after color shades and styles on the market. We have white and off-white marble, light and medium shades of cream/beige, darker mochas, and maroon. Because we also manufacture and import marble thresholds, countertop blocks, and window sills made from the very same raw material, customers are guaranteed excellent color match between these different products. Nalboor is located in Miami, Florida, but ships to commercial and private customers throughout the continental United States. We use reliable, affordable overland freight companies to deliver our material, and most orders involving less than several thousand pieces of tile can be processed and made ready for delivery within one or two business days. If you need premium-quality marble tiles at an affordable price, remember the name Nalboor. We offer our beautiful marble tiles at truly wholesale prices, and our extensive line of marble tile products are available throughout the calendar year. Remember, purchasing from our company means doing business directly with the importer and distributor. We invite you to take a close look at our product pages on the Nalboor Tiles website. For the latest information on prices, shipping schedules, and quality assurance, contact us today and speak with our knowledgeable customer service staff. We will show you exactly how to obtain the world’s finest marble tiles at a price you never imagined possible.